Prestigious and powerful, the medieval towers of Bologna keep watch from their perch above the rooftops, silently witnessing the passage of centuries. These iconic remains of times past, some still very present and others just ghosts, now tell their story. 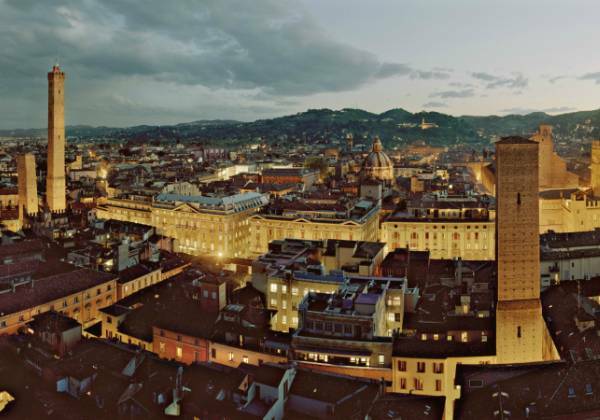 Come to observe Bologna’s towers up close and discover their mysteries. After winding our way through the checkerboard of towers and well-worn passages through the city center, we’ll pause to admire the view from the dizzying height of the Prendiparte Tower; at 60m, it is second only to the Asinelli Tower. From the tower’s terrace the panoramic view is undeniably stunning. Walking tour with a local, expert guide during which the Towers will be presented: Accursi, Agresti, Alberici, Asinelli, Azzoguidi, Bertolotti, Carrari, Catalani, Conoscenti, Dalle Perle, Galluzzi, Garisenda, Ghisilieri, Guidozagni, Lambertini, Lapi, Oseletti, Prendiparte, Ramponi.